Charlottesville showed that our First Amendment jurisprudence hasn’t reckoned with our Second Amendment reality. Seen in isolation, Conrad’s order was grounded in solid First Amendment doctrine: Charlottesville could not, he ruled, relocate the racist demonstrators “based on the content of [their] speech.” This is textbook law, but one is left to wonder whether it takes into account armed white supremacists invading a city with promises of confrontation. Conrad’s decision seems to have been issued in a vacuum, one in which Second Amendment open-carry rights either swallowed First Amendment doctrine altogether or were simply wished away, for after-the-fact analysis. The judge failed to answer the central question: When demonstrators plan to carry guns and cause fights, does the government have a compelling interest in regulating their expressive conduct more carefully than it’d be able to otherwise? This is not any one judge’s fault. It is a failure of our First Amendment jurisprudence to reckon with our Second Amendment reality. Charlottesville proves that this issue is hardly theoretical anymore. In his order, Conrad chose to exclude from his First Amendment analysis the very strong possibility that demonstrators would carry weapons. (The city police warned the court that hundreds of protesters would bring firearms and that militia members would be in attendance.) But, ironically, by protecting the free speech rights of the white supremacists, Conrad may have ultimately suppressed speech by ensuring an armed confrontation between the neo-Nazis and the counter-protesters would break out and that police would be powerless to stop it until blood was spilled. Virginia Gov. Terry McAuliffe later claimed that the militia members “had better equipment than our State Police”—and that their weapons prevented law enforcement from imposing order and protecting peaceful protesters. While we don’t yet know the full details of what happened or how, the governor’s statement suggested that the presence of large quantities of lethal guns had in fact effectively silenced the many people who’d assembled to peacefully express their opposition to racism. This conflict between the right to bear arms and the right to free speech is nothing new, but the sudden surge in white nationalist activism has made it painfully obvious that, in the public square, the right to bear arms tends to trump the right to free speech. Confederate sympathizers are bringing weapons of war to their demonstrations—just last month, in fact, Ku Klux Klansmen carried guns to a protest in an adjacent Charlottesville park. 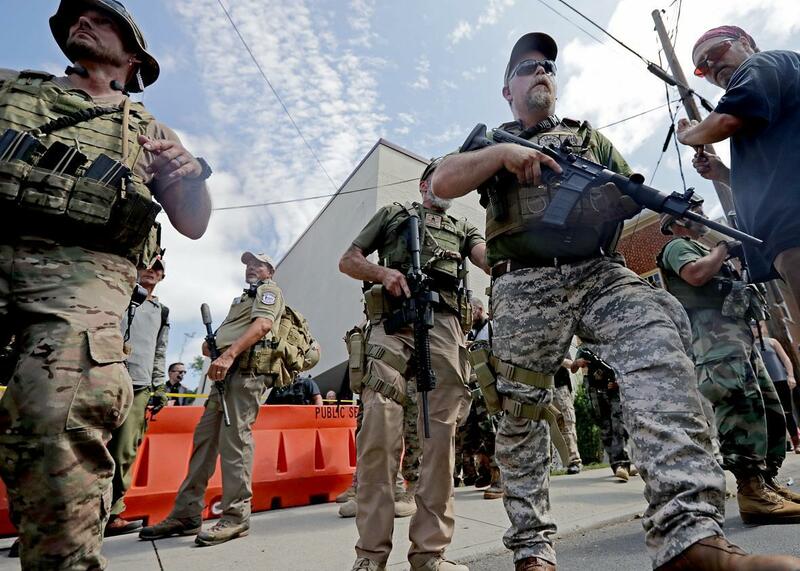 Forty-five states, including Virginia, allow some form of open carry. So long as armed demonstrators comply with their permits and do not openly threaten anyone, their protests are perfectly legal. So the government doesn’t get to bar neo-Nazis from marching in a park just because they’re neo-Nazis. But what about neo-Nazis who are toting around assault weapons? As the world saw on Saturday, armed agitators can quickly turn a public forum into a public brawl and hijack peaceful assembly. Current First Amendment doctrine praises the open debate that is supposed to occur in our streets and parks. But it is poorly equipped to help courts apply the law when bullets may accompany the free exchange of ideas. The seminal case protecting the rights of white nationalists to march in the streets is National Socialist Party of America v. Skokie, in which the Supreme Court ruled that the government could not bar neo-Nazis from marching through a Jewish neighborhood in Illinois. * Most civil libertarians (us included) believe the court got the Skokie case right. But it’s increasingly clear that Skokie can’t always help courts figure out how to deal with a post-Heller, post–“stand your ground” white nationalist protest. Whatever the courts were attempting to protect in the Skokie case wasn’t protected in Charlottesville. The marchers in Skokie didn’t promise to bring guns and armed militias to protect themselves. Moreover, the “threat” posed by Nazis marching in Illinois, while symbolic and terrifying, especially in a town of Holocaust survivors, was not the threat that we are coming to your town with the power to kill you. Second Amendment enthusiasts will tell you that they don’t intend to deliver any message of this sort when they parade with semi-automatic weapons. Their message is merely that guns are outstanding. But one of the lessons of Charlottesville 2017 is that sometimes, when 500 people promise to come to a “protest” with guns to hurt people they want to see extinguished, they plan to do just that. It’s become amply clear that open carry in Charlottesville led to little discussion and lots of fighting. Indeed, open carry seemed to guarantee that fewer people could speak and that the police had no choice but to wait until there was actual bleeding to call off the rally. If bringing guns to a speech event pushes the line for incitement past the point where people have gone mad, it’s time to have another look at the intersection of speech and open carry. Rallies with guns cannot be treated, for First Amendment purposes, in the same fashion as rallies with no guns. When the police are literally too afraid of armed protesters to stop a melee, First Amendment values are diminished; discussion is supplanted by disorder and even death, and conversations about “time, place, and manner” seem antiquated and trite. In his analysis, Conrad treated today’s white nationalists like the neo-Nazis who planned to march through Skokie. * That was a mistake. Ideas may not be able to hurt us, but assault weapons surely can. That’s why the white supremacists who marched through Charlottesville this weekend carried guns instead of Pokémon cards. It’s perfectly reasonable for courts to consider the speech-suppressing potential of guns when evaluating a city’s efforts to keep the peace. And it will be perfectly lethal if they fail to take the Second Amendment reality into account, as they reflect upon the values we seek to protect with the First. *Update, Aug. 17, 2017: The caption on the photo of this piece has been updated.